It's time. You've waited for years and now the time has finally arrived. It's time to send your child down the path of the Dark Side! You need to begin with some baby steps. You don't start by teaching him the Force Chokes or by teaching him how to wield a red lightsaber. You don't start by teaching him Force Lightning moves either. You need to take a calmer approach to it by teaching your child how to relax like a Sith Lord. Yes, the path to becoming a true Star Wars villain starts, now with learning how to wield the Dark Side, but with how you relax at movie time. Every young Sith in training starts with this cozy Darth Vader comfy throw for kids. This officially licensed Star Wars comfy throw is one comfortable accessory for your child's next movie night. It has sleeves on it, so your child can wear it like a rob. It's made out of a soft and cozy material that will keep him warm during movie night, but that's not even the best part. The throw comes with Darth Vader's suit designed into the front. 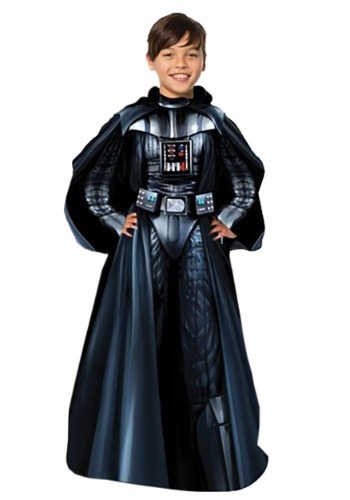 Your child will be taking his first steps to the Dark Side!